J.K. Pulley Company, Inc. is a provider of precise gear hobbing services. We are outfitted with the latest gear hobbing equipment capable of effortlessly handling our client’s custom gear manufacturing needs. We are capable of cutting spur or straight-cut gears, helically cut gears, pinion gears, and many other types of gears. We are skilled in manufacturing gears from a number of materials, including steel, stainless steel, steel alloys, aluminum and other materials. 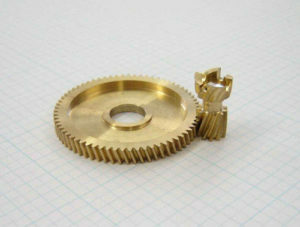 We are equipped with a Pfauter gear hobbing machine, which is capable of cutting gears of up to 14 inches in diameter. We are equipped with Pioneer broaching machines, which are used in our gear manufacturing process. We perform a complete inspection of parts using state-of-the-art inspection equipment to ensure quality.